Easter traditionally marks the end of summer and many Aussies take to the bush for the last camping weekend of the season. SOTA activators are perhaps not so different if the number of activations over this weekend were any guide. My lady and I decided that a full-on expedition taking in several SOTA Summits would be a good thing to do, so we spent some time poring over maps and consulting the SOTA database. Last year (2013) we activated a couple of Summits on the northern part of the Eskdale Spur Track and since then we have wanted to explore the southern part of that trail. The SOTA Mapping Project showed that there are three Summits along that part of the trail: an unnamed Summit VK3/VE-071, Mt Yorke and Mt Emu, all around 1300 metres and each worth 8 points. We decided that would be our Easter expedition for 2014. A study of the topographic maps showed that there were a couple of possible access routes. After weighing up the alternatives we decided to come in from Eskdale along Little Snowy Creek Road via Smyths Road and the Bowman No.1 trail to the Eskdale Spur Track. We found that this worked out very well, with the roads and trails well signposted at all but one place. At the end of Smyths Road the trail takes a sharp right-hand bend and goes over an old wooden bridge. A little further on it reaches a fork, with the left-hand fork appearing to go in the direction of the Bowman No.1 trail. In fact the right-hand fork is the one to take. Fortunately we went that way because we felt it “looked right”. Sure enough after a steep climb we found the Bowman No.1 trail on the left. The trail is smooth but we did encounter some tree debris down on it, which we stopped to clear. The first Summit, VK3/VE-071, is just off the Eskdale Spur Track a couple of kilometres down from the intersection with the Bowman No.1 trail. A track goes off to the left heading for the Summit, but someone – presumably the park authorities attempting to stop 4WDers from accessing it – has felled a large tree across this track. It’s only a short stroll from the intersection to the Summit. We parked the Hilux next to the fallen tree and got out to do a recce. 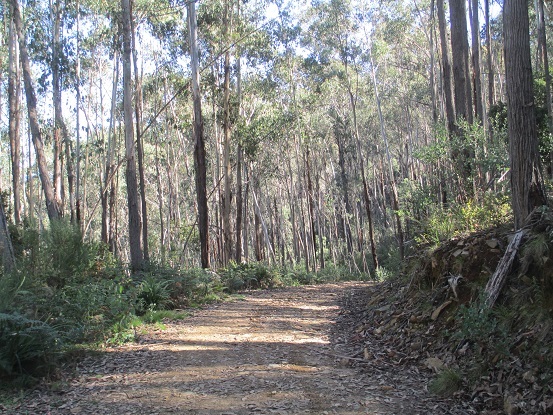 The area is densely wooded with very tall, mature gum trees. These go straight up for many metres before any branches grow out from the trunk, which presents some challenges for those wishing to use them as an antenna support. 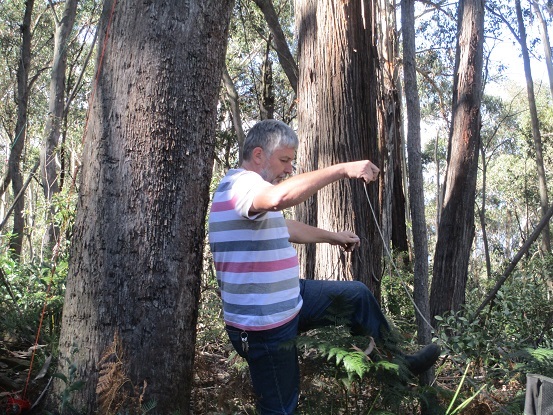 We tried a couple of alternatives, finding one or two dead saplings that stood in a convenient spot but forgetting the lessons from previous expeditions; dead wood does not make a good antenna support! After nearly being brained by the top section of one of these as it fell we gave up and cast about for a living tree that would fit the bill. While dancing and dodging the falling bits I managed to lose my spectacles somewhere in the undergrowth, which could have been a show-stopper. After searching carefully we found them in a tangle of trampled twigs and leaves. They were a bit bent and battered as I had evidently trodden on them in all the excitement, but at least they weren’t broken. If the first SOTA activator gets naming rights to unnamed Summits then I dub this one “Spectacle Hill” as a reminder of this event, and of the “Antenna Dance” in which I made something of a specacle of myself (pardon the pun). Eventually we found a tree with a suitable branch at about 6 metres up. There was a fair bit of undergrowth around it to tangle the antenna wire in, but after a bit of crashing about in the bushes we got the antenna up. I ran a slightly extended feeder cable so that we could set up the station out in the open, where a patch of sunlight kept the cool breeze at bay. I checked the iPhone not really expecting to find a 3G signal, but it showed two or three bars so I put up a quick spot and quickly got going on 7MHz. In short order I worked VK1MA, VK3CAT, VK2CCW/P, VK3EK/P (S2S), VK3PF/P (S2S), VK3ASC/P (S2S), VK2YN, VK3MRG/7, VK3XL, VK3DET and VK2IO. Then I moved up to 14MHz where I worked VK2YK/6, VK5PAS, VK3MRG/7, ZL2AOE, VK2KTT, VK2TWR/P (S2S) and VK3ASC/P (S2S). 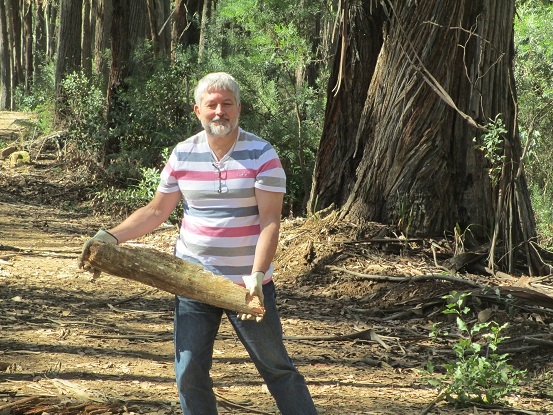 Delighted with this haul, we took everything down and went on along the Eskdale Spur Track to our next Summit, Mt Yorke. The Summit itself is a little distance (200m) from the trail through dense woodland. The trees here are mainly younger and smaller than those at the previous Summit and present better opportunities for antenna rigging. We found a clearing with a patch of sunlight close to a handy tree, rigged the antenna and got started. Once again there was a reasonable 3G signal so I could post a spot via SOTA Goat. Shall I work him or ring him? I started on 7MHz where over about 35 minutes I worked VK2TWR/P (S2S), VK3PF/P (S2S), VK3ASC/P (S2S), VK3CAT, VK3FPSR, VK3EK/P (S2S), VK2DAG, VK3ANL, VK2IO, VK1MA, VK2MT/P (S2S), VK3VTH/P, VK3AMB, VK3UH, VK3MNZ, VK3ARR, VK3DEE, VK2CCJ, VK5BJE/3, VK1MBE/P (S2S), VK3AFW, VK3ETC/P, VK3UBY and VK3IL/P. I had intended to try 14MHz but as the sun had by now slipped behind the trees and we were getting a little chilly we decided to move on to our third Summit of the day. The Eskdale Spur Track had up to this point been relatively smooth and could be negotiated by a 2WD vehicle at least in dry weather. Beyond Mt Yorke, however, this changes and the trail is very rocky and is quite steep in places, with some deep wash-outs. A 4WD is required from here on. 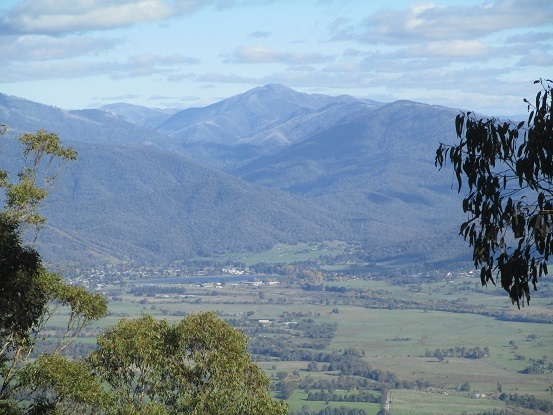 Mount Emu is a popular launching spot for hang gliders, and there is a wide cleared area on the Summit from which there are spectacular views down over the valley towards Mount Beauy and Tawonga. There is even a patch of synthetic turf from which fearless (read barking mad) hang glider pilots launch themselves into space. If you’re into that sort of thing you could hardly pick a more spectacular spot to indulge in it. The cleared area is surrounded by low gum trees that present plenty of suitable branches for antenna rigging. We set up some distance back from the brink of the launching pad, starting once again on 7MHz. 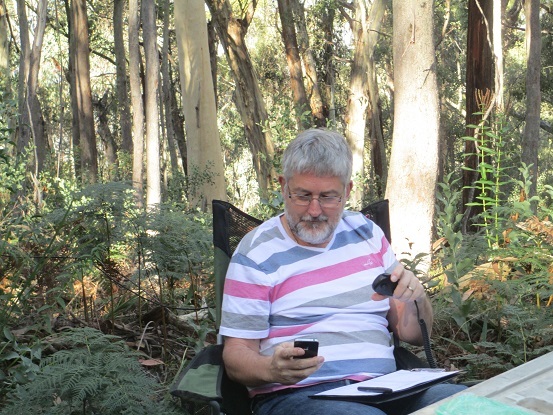 The band was very crowded with several SOTA activators working pile-ups around the usual frequencies, so I took the opportunity to have a cup of tea while waiting my chance to get a word in. This time there was no need to post a spot: the band was so busy that the lurking chasers were bound to find any activator who popped up anywhere on the band. In just over 20 minutes I worked VK3ASC/P, VK3PF/P, VK2DAG, VK5NIG, VK2IO, VK3BYD, VK3FPSR, VK5BJE/3, VK3BHR, VK3AFW, VK2TWR/P (S2S), VK5PAS, VK2JNG/P, VK3CAT, VK3XL, VK2CCJ, VK3ARR, VK3DET, VK3AMB, VK1NAM, VK5HCF, VK2CCW, VK3YN, VK3IL/P, VK3ETC, VK7BO, VK3ANL, VK3UH, VK3DEE and VK1MA/P. After a chat with a friendly 4WDer who stopped to look at the view and wanted to know what we were doing, we decided that we’d had enough SOTAing for one day. The 14MHz band was, from the look of the spots on SOTA Watch, beginning to open to Europe but the sun was going down and we still had some 4WD trails to negotiate before getting down off the hills. From Mt Emu we followed the Eskdale Spur Track down to its intersection with Trappers Gap Road. This section is fairly steep and rocky in places and a 4WD is advisable here. Trappers Gap Road is smooth and well graded and suitable for 2WD Vehicles. 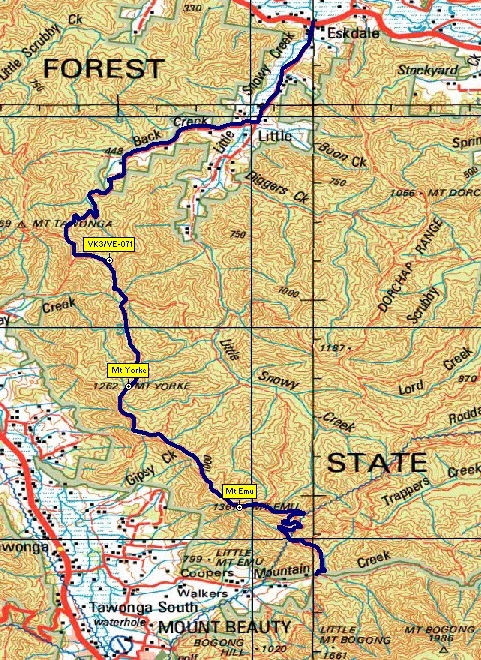 It joins the sealed Mountain Creek Road adjacent to the Mountain Creek camping area, and following this road it rejoins the Kiewa Valley Highway at Tawonga. From there it’s about 80km back to Wodonga.